May 2014, Wednesday Lunch, Party of 2. Behold! A brightly-colored food truck! 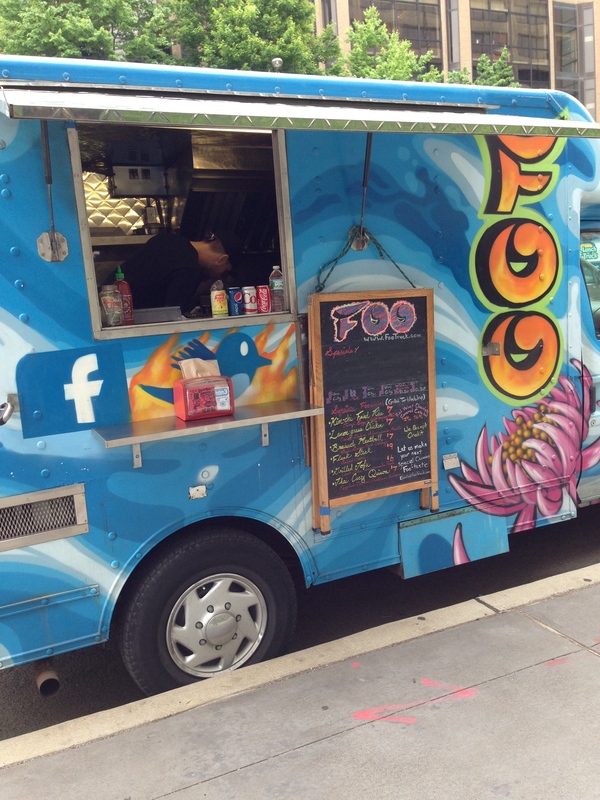 It’s “Foo Truck”. Like a bee attracted to bright colors, I knew I had to check out this truck. Unsurprisingly, it was staffed by near-hipsters (real hipsters are so “over” food trucks – they’d peddle around a hot dog cart so they could be more ‘green’). Surprsingly, it took me a few seconds to try and piece together what it was they were selling: what was a “foo”? (I kept thinking of Mr. T: “I pity the foo'”) Furthermore, what was a foo-which? Are there items on the menu that aren’t foo-whiches? And why was there a big blank under “specials”? Ok – it turns out that they are selling their take on a sandwich, in which the “bread” is a grilled flour tortilla, and the innards are the variety of fillings that they boast on their menu. Being half-korean, I could not help but hear the kimchi fried rice (with Chinese sausage!) calling … One foo-which please! … kimchi fried rice! 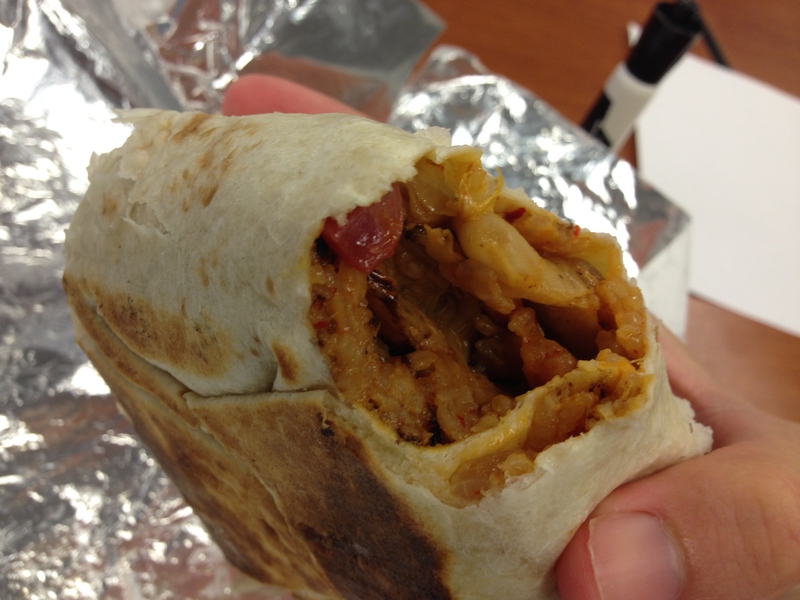 I would best describe this thing as a hot pocket … but more delicious and less likely to cause diarrhea. The filling was great, with a nicely cooked kimchi (it was hot!) and good chunks of sausage. And, because rice was a major component, it was very filling indeed – try as hard as I could, I couldn’t finish it – it’s about 85% the size of a chipotle burrito. As much as I liked the filling, I do want to suggest that the thing could have benefited from some sort of charred leafy green (maybe like some brussel sprout leaves?) or perhaps a crunchy vegetable (bean sprouts?) – just to try and add some textural variety and fiber to the gut-filling rice and meat (yes, i know that was what the kimchi was for – so maybe include more of the leafy green parts of cabbage next time!). My colleague had one involving an assortment of veggies and quinoa – she approved! dessert at Foo Truck consisted of these red velvet cake balls. they. were. crazy! 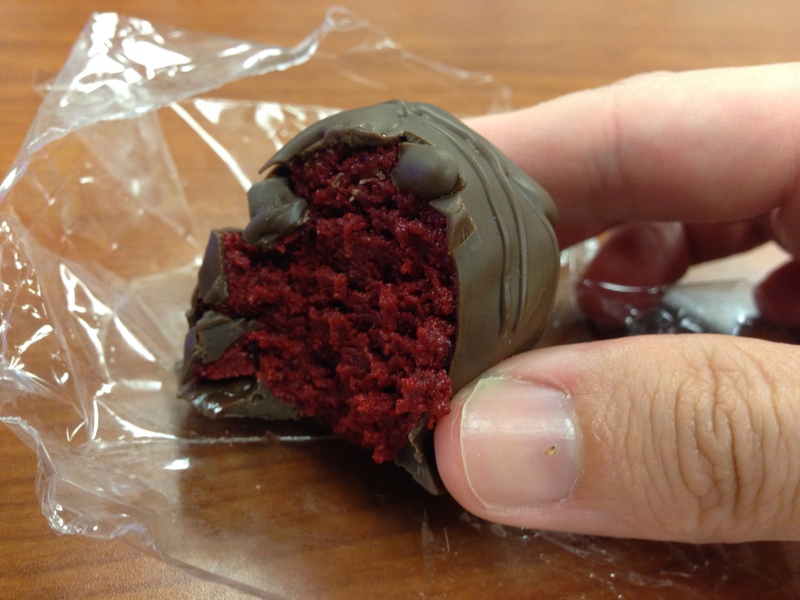 Imagine a cakeball … and then make it 3.7x better … and that’s what this was. It’s a pretty darn steep price at $1.50 for one (or $5 for 4) and as you can see, they are pretty tiny … but they’re probably so loaded with sugar and fat, so you probably shouldn’t eat more than one. I was very satisfied with my lunch at Foo Truck. I will blame it, however, for inducing a food coma that I could only remedy with caffeine (from Joe Coffee, of course). 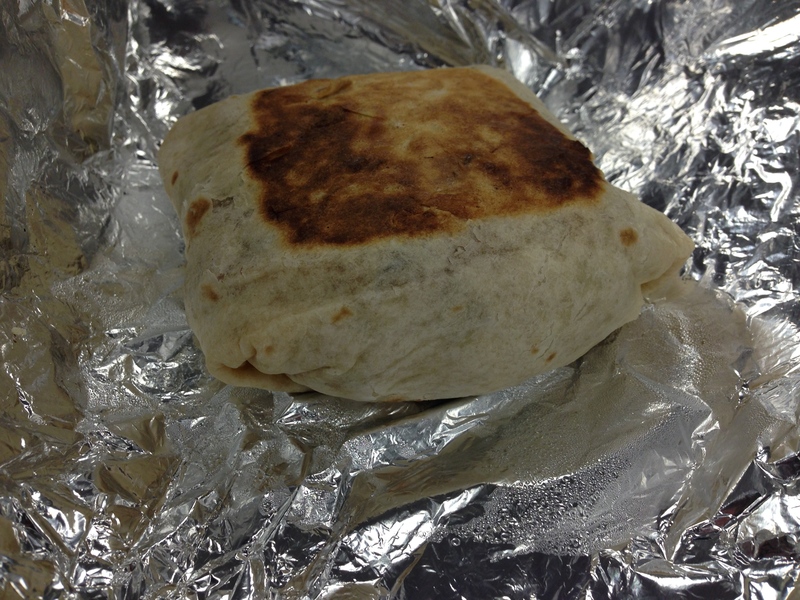 But if that’s really the worst thing about eating at Foo Truck, then I’d say they’re in good shape. I’d go back. I will go back! P.S. Similar to last time’s post about Joe Coffee’s vegan chocolate chip cookie, this time I bought a gluten-free salted PB cookie, and it was awesome. Great saltiness, awesome thickness, and wonderfully chewy … I’m thankful I only got one, because I had gotten any more, I would have eaten them all. « that’s a serious board!